The Star Wars rewatch returns with Episode V – The Empire Strikes Back. Eppu: As Han and Leia et al. are trying to flee Hoth, Millennium Falcon vs. three Imperial destroyers and their T.I.E fighters. You can tell that the special effects technology had taken a huge leap forwards in between A New Hope and The Empire Strikes Back. Spin it! 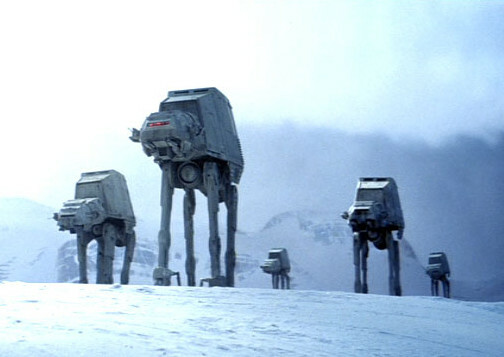 Erik: Snow speeders vs. imperial walkers on Hoth. The fight feels like a desperate, doomed rearguard action, but even in doomed rearguard actions there is room for heroism. Erik: “Luminous beings are we, not this crude matter.” An elegant description of the Force from a more civilized age, before the dark times, before the midichlorians. Eppu: There are so many fantastic lines in Episode V, it’s really hard to choose! I guess it’ll have to be “Who’s scruffy-looking?” by the one, the only Han Solo, delivered as if that’s the most insulting term in Leia’s outburst. Also, C-3PO’s “Sir, it’s quite possible this asteroid is not entirely stable.” is fantastic, and one of Leia’s shiny moments that I really like is “You’re not actually going into an asteroid field?”. Erik: General Rieekan who commands the rebel forces on Hoth. Plainspoken, understated, and you can tell that he cares about the people under his command. He’s exactly the sort of person who should be in charge of a military operation. Erik: The strange old hermit on Dagobah is Yoda, former head of the Jedi council. Frank Oz gives the character such life that you can tell he’s not just playing the fool to test Luke’s patience (although he’s totally doing that, too), but that Yoda is wise enough to take a childish delight in rummaging through Luke’s luggage and playing with his flashlight. It’s a test and a lesson wrapped up in one. Eppu: R2-D2 tweaking the hyperdrive on Millennium Falcon to allow for our POV characters to flee the Cloud City. Erik: The Millennium Falcon dodging TIE fighters and star destroyers as it escapes from Hoth. Now we know that Han isn’t just all talk when it comes to his piloting skills. Erik: The pan up from an enormous foot landing on the ice of Hoth to see an imperial AT-AT walker, then zooming out to see more of them coming. Even on a small screen, it’s a great “Oh crap” moment. 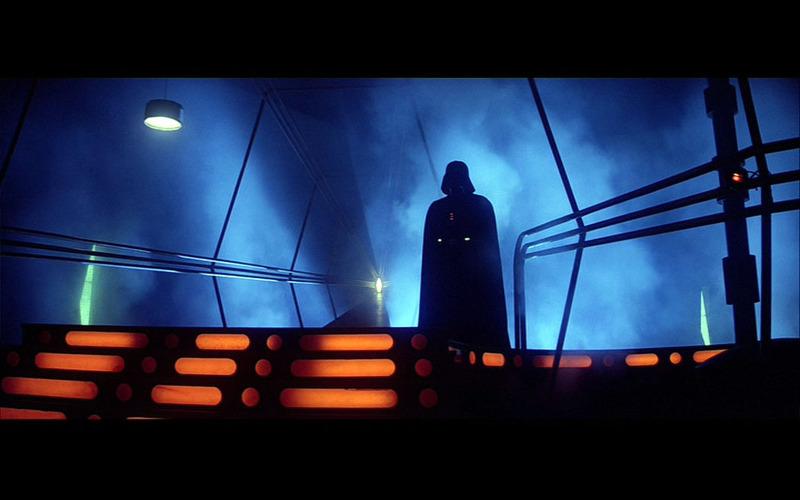 Eppu: Vader standing on top of the stairs in Cloud City’s carbon freezing room, silhouetted against blue, with reddish light on the stairs below. Emily Asher-Perrin in her write-up at Tor.com calls The Empire Strikes Back “a shockingly beautiful film”, and it fully is. The lighting, especially, is breathtaking; love it. Also, Cloud City against a red sky / sunset. Eppu: One of Leia’s brilliant lines – although terribly frustrating for her – is “I am not a committee!”. He’s awfully dry and (sadly) played as a comic relief, but I like a lot of C-3PO’s retorts, too (e.g. “Of course I’ve looked better!” and “R2-D2, you know better than to trust a strange computer.”). Erik: “Yeah, you’re a real hero.” Han to Lando, when Lando tries to dodge the blame for letting the empire set a trap for Han and Leia in Cloud City. It says a lot about how Han’s character has changed since we first met him in the cantina at Mos Eisley.